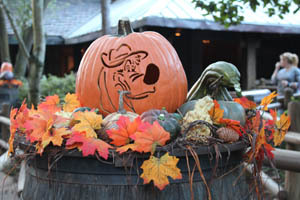 Br’er Bear (below, left) is on a pumpkin in Br’er Rabbit’s Candy Patch. 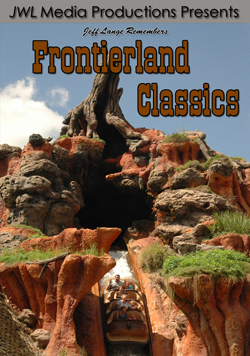 There are two treat trails this year, one in Frontierland at Splash Mountain, and one between the new Fantasyland Train Station and Space Mountain! 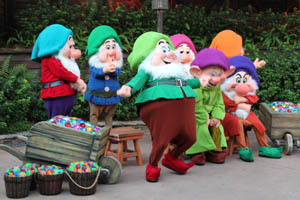 We even enjoyed a dance by one of the Seven Dwarfs (below, right). We believe this one is Happy – in any case, he is happy! 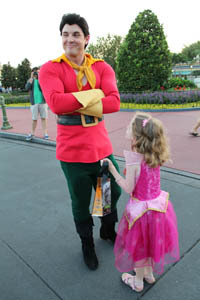 As we were talking with Gaston, a young fan came up to chat (below, left). 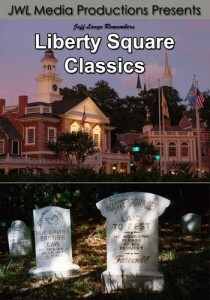 he seems to be pretty excited about his new tavern that will be opening soon! 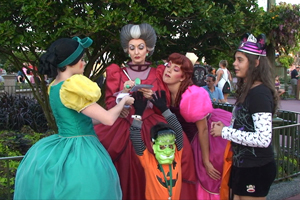 Lady Tremaine, Anastasia and Drizella also greet fans in the hub before it gets dark (below, right). 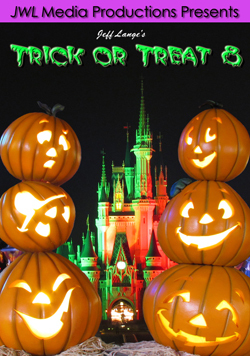 Video #1 – Gaston Talks To Us at Mickey’s Not So Scary Halloween Party 2012, Magic Kingdom Walt Disney World – Gaston talks to us at Mickey’s Not So Scary Halloween Party! 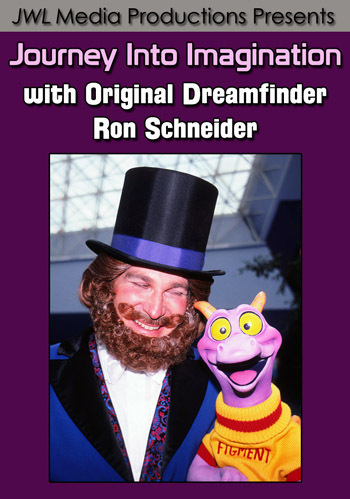 He is getting ready for his tavern opening in Fantasyland. 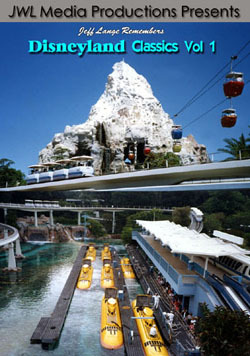 The Fantasyland treat trail is now called the Casey Jr. Candy Junction! 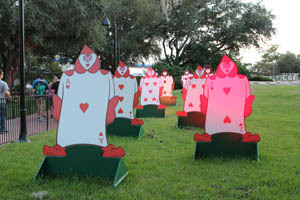 The cards from Alice in Wonderland (below, left) still are present, as are many of the other displays you’ll remember. 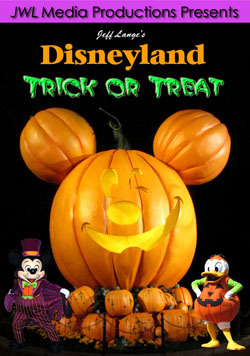 We waited for Mickey’s Boo to You Halloween Parade as a new street party arrived in Town Square (below, right). 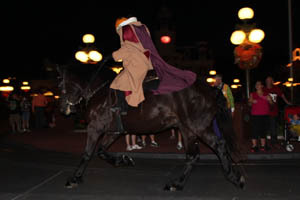 The Headless Horseman was rumored to be replaced by the street party, but he isn’t – the Headless Horseman still “rides tonight” (below, left). 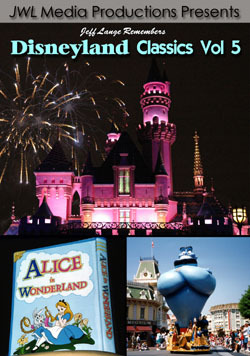 The opening float is different than previous years, and the costumes here are also different (below, right). 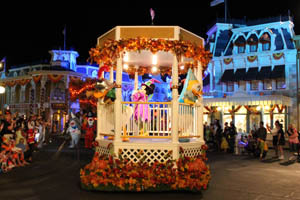 This character parade float includes Mickey, Minnie, Daisy and Donald all dressed for Halloween (below, left). 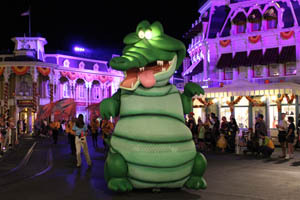 Tick-Tock Croc (below, right) is always a formidable sight as he travels down Main Street! 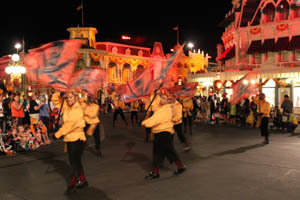 The pirate and wench scene is now gone from the parade, and pirates with flags (below, left) are now added. 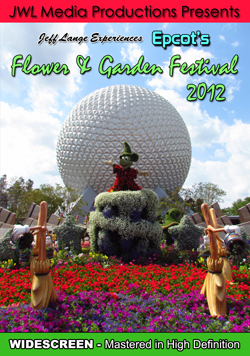 These were brought from the former Pirates and Princess Party Enchanted Adventurers Parade! 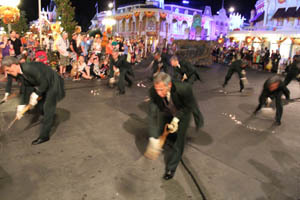 The Grave Digger Precision Drill Team (below, right) are always a crowd favorite. 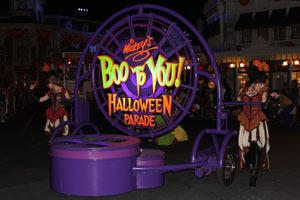 The Haunted Mansion float features the Hitchhiking Ghosts (below, left). 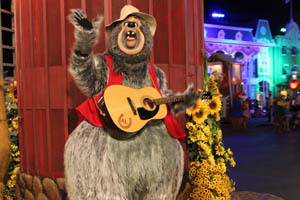 Big Al (below, right), came out of hibernation with the rest of the Country Bears and waves from his float. 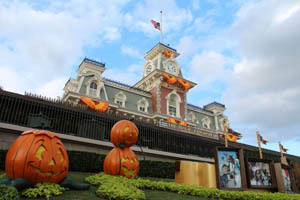 Video #2 – Mickey’s Not So Scary Halloween Party 2012 Boo To You Parade Premiere w/ New Pirate Segment – This is from opening night of Mickey’s Not So Scary Halloween Party 2012 at Walt Disney World’s Magic Kingdom! 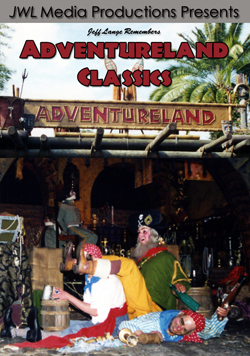 New this year are the opening costumes, a revamped Pirate segment (originally from Disney’s Pirate & Princess Party Enchanted Adventurers Parade), no wenches or Pirate Angelica plus a few minor tweaks. 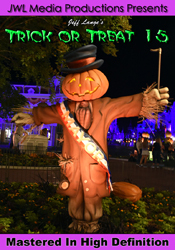 Barbossa is now on the float, not walking next to it. 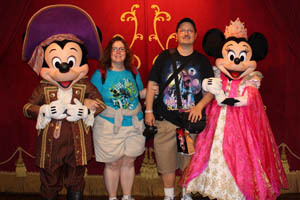 We met Mickey and Minnie, who were dressed in their Pirate and Princess outfits (below, left). 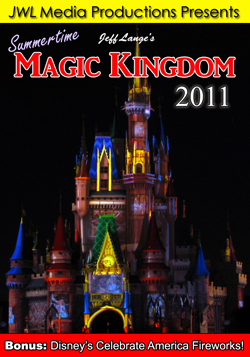 It is very possible that they dress in other clothes as well, and we’ll check that out at a future party. 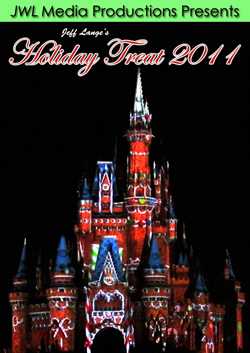 Phineas (below, right) looks for treats in our candy bag. 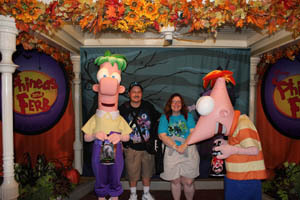 Phineas and Ferb are located next to City Hall this year in the place of Duffy, but they aren’t dressed in costumes. 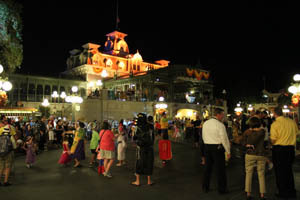 Video #3 – Mickey & Minnie, Phineas and Ferb Meet and Greet us at Mickey’s Not So Scary Halloween Party 2012 – Mickey and Minnie greet us in their Pirate and Princess outfits, and Phineas & Ferb are in their standard outfits, but with a Halloween backdrop next to City Hall! 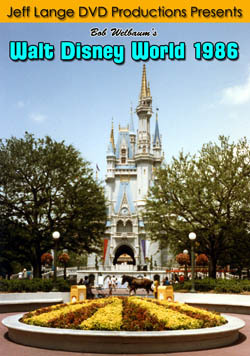 You can find Mickey & Minnie inside the Town Square Theater. 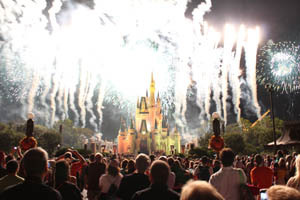 Happy HalloWishes fireworks (below, left) never fails to disappoint! 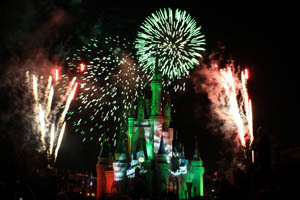 Different villains are all part of this festive display, which features 180 degree fireworks (below, right). 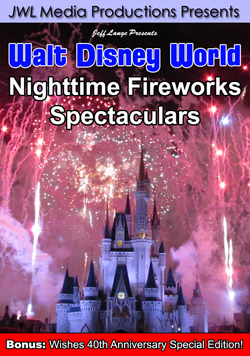 Video #4 – Mickey’s Not So Scary Halloween Party Happy Hallowishes Fireworks 2012 Premiere, Magic Kingdom – Happy HalloWishes Fireworks from opening night of Mickey’s Not So Scary Halloween Party 2012 at Walt Disney World’s Magic Kingdom! 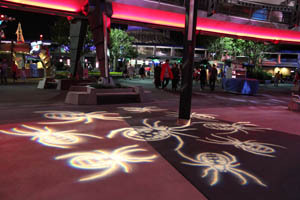 The lighting gets better each year, with spiders invading Tomorrowland (below, left). 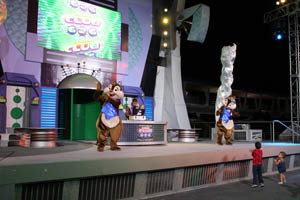 Chip and Dale hang out at Stitch’s Club 626, where guests can dance with popular Disney characters (below, right). 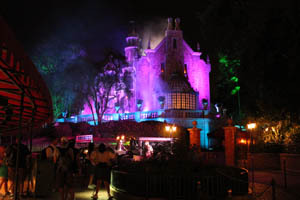 The Haunted Mansion casts a spooky glow at midnight (below, left). 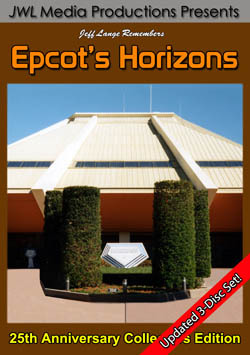 The lighting is always ominous, and fog wafted through the queue. 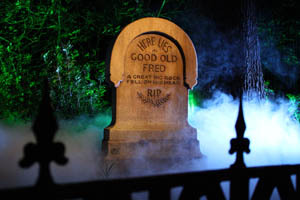 Good Old Fred (below, left) in enveloped in a foggy mist making it extra spooky for the party (below, right). 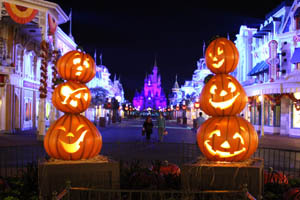 The pumpkins at Town Square are back, and always make for a beautiful photo as guests leave for the evening (below, left). 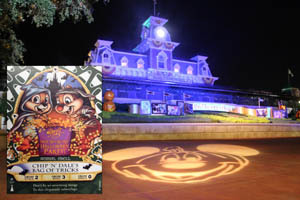 There is a new Sorcerers of the Magic Kingdom Halloween spell card with Chip ‘N Dale, created for the Party (below right, along with the Main Street Train Station and decorative Mickey). 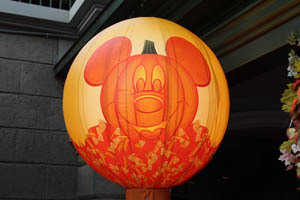 We had a great time at the first Mickey’s Not So Scary Halloween party of 2012 and plan to return again to experience more details and report them here soon!